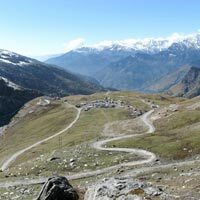 Morning on arrival at Delhi airport you will be pickup by our representative and then transfer to Manali. Manali is an important Himalayan hill station of northern India which is famous for its superb beauty of nature, cool & pleasant ambiance, adventure sports and amazing tourist attractions. 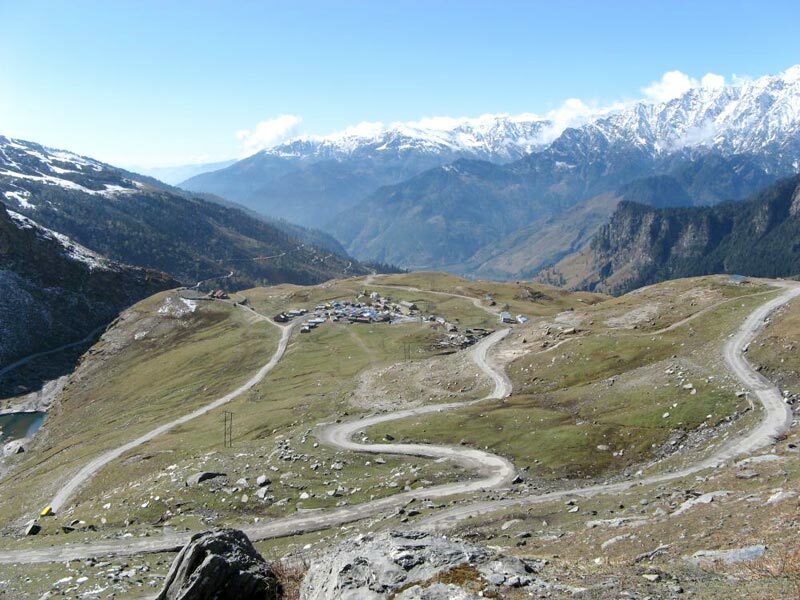 On your tours to Manali you will have wonderful opportunity to see the spectacular view of snow-capped Himalayan mountain peaks, Fruit orchards, Wild flower gardens, picture-perfect places, architectural structures, temples, etc. Night stay at Manali. Early Morning proceed for full day tour of Rohtang Pass - The majesty of the mountains and the glaciers can be seen at their best after enjoying this snowy heaven. Take a sledge ride down the slopes & try luck by climbing the little snow hills. On descenting to Manali, halt at the Rahalla falls. The Magnificent views and natural beauty are a never-ending source of delight. Evening come back to hotel. Night stay at Manali. Morning proceed to Visit the 450 years old Hidimbadevi Temple built in the tranquil and serene woods, the oldest temple in Manali, Tibetean center & monastery, Vasisth village, known for its hot Sulpher springs Roerich art Gallery. Later visit Naggar Castle and local Bazaar. Night stay at Manali. Evening drive to Shimla. On arrival check in to hotel. Night stay at Shimla. Morning after breakfast check out from hotel and drive to Shimla. Perched at 7000 feet above sea level, the heady combinations of Chill Mountain air, orchards and colonial charms still make Shimla a dream get away. On the way visit Pandoh dam and Hanogi Devi temple enroute to Manali. Also visit famous Vaishno Devi temple at Kullu. On arrival check in to hotel. Night stay at Shimla. Morning proceed for the sightseeing of Kalibadi devi Temple, Jakhu Temple, Hanuman Temple or stop for a while at the beautiful stained - glass - windows of Christ Church, which was built in the 1850 's. Afternoon visit Kufri at 30 Minutes drive from Shimla, an exotica of nature as a place surrounded by dense forest and snow capped mountains amidst virgin peaks and natures flora and fauna where one can completely relax and tune oneself for natural beauty. Evening free to enjoy the scenic beauty of Kufri. Fagu, Indira Gandhi Holiday Home, horse riding (optional) in the apple orchids. Rest of the day is free to explore various scenic sights or visit mall road and shopping. Night stay at Shimla. Morning check out from hotel and drive to Chandigarh. Visit Pinjour garden on the way, boating in Sukhna Lake, Rock garden and Rose garden. Then proceed to Delhi. If time remains then visit Kurukshetra on the way of Chandigarh Delhi. On arrival check in to hotel. Night stay at Delhi. Breakfast at hotel. Morning drive to Agra, enroute visiting Sikandra - the red sandstone mausoleum of Emperor Akbar. On arrival check into hotel. Afternoon visit Taj Mahal, regarded as one of the Wonders of the World. Then visit the massive Agra Fort which has been the seat of Mughal rulers for several years followed by Itmad-ud-daulah Tomb, Jama Masjid etc. Night stay at Agra. Breakfast at hotel. Morning drive to Jaipur, enroute visit world famous Mughal capital Fatehpur Sikri. On arrival check into hotel. Night stay at Jaipur. Breakfast at hotel. Morning excursion to Amber Fort. At Amber Fort you climb up the fort on elephant's back like the Maharajas and visit the Amber Palace of the Kuchchawa rulers. Afternoon sightseeing of pink city visiting Hawa Mahal (Palace of Winds), The City Palace, Jantar Mantar etc. Evening drive to Delhi. On arrival check in to hotel. Night stay at Delhi. Morning check out from hotel then proceed to visit Birla temple, India Gate, President House, Indira Gandhi Museum, Qutab Minar, Lotus temple then drive to Rly station/Airport to board your train/flight for your onward journey.